On May 6, 1937, the Hindenburg airship caught fire as it was trying to dock at Naval Station Lakehurst in Manchester Township, New Jersey. Thirty-six of the 97 people onboard were killed, in addition to one crewman on the ground. The disaster is often called the most devastating loss of life during the zeppelin era, but the Hindenburg wasn’t the worst airship accident. In fact, it wasn’t even the first one. The U.S.S. 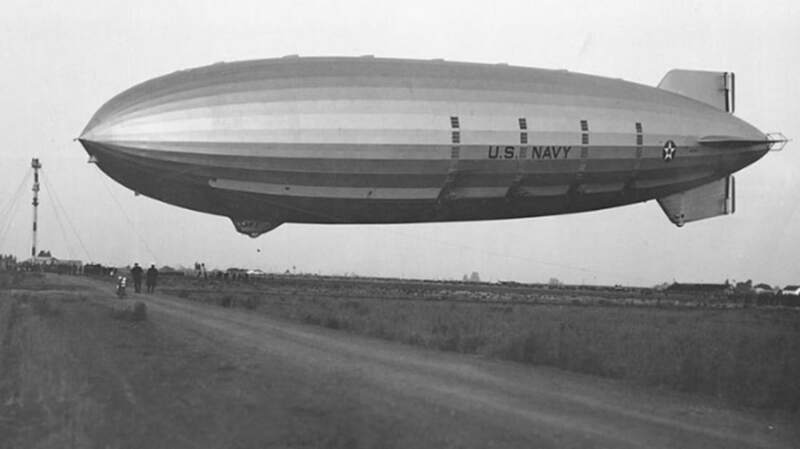 Akron, a helium-filled rigid airship that belonged to the Navy, was trouble from the start. Just a few months after its official maiden voyage on November 2, 1931, the Akron broke away from handlers as a group of Congressmen were getting ready to board the ship for a demonstration. Just a few months later, on May 11, the ship ran into trouble while attempting to moor at Camp Kearny near San Diego. Three sailors were hoisted into the air by the mooring lines when the ship became uncontrollable. Two of them fell to their deaths. The ship departed on April 3, 1933, for what would be its final flight. The mission was to calibrate radio equipment along the New England coast; the 76 passengers onboard included high-ranking officials such as the Chief of the Navy’s Bureau of Aeronautics and the commanding officer of NAS Lakehurst. Just after midnight on April 4, strong winds hit the Akron hard. It plunged 1000 feet in a matter of seconds, and in order to make it rise again, the crew decided to dump the water ballast. Unfortunately, it was too much, too fast—the crew lost control of the dirigible and the Akron crashed into the ocean, killing all but three passengers. Another airship was sent to help with rescue attempts; it, too, crashed in the strong winds, killing two of the seven crew members. When the very public and highly photographed Hindenburg explosion happened four years later, the idea of travel-by-airship perished with it.